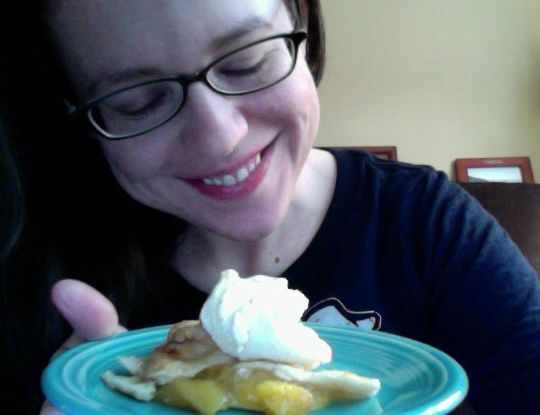 Also, me & my birthday pie are honored to have been featured in this post by Jerry “Professor Ceiling Cat, PhD” Coyne. & On the “my friends write great blog posts” note, be sure to check out Brother Blackford’s wise and thoughtful commentary on the issues discussed in my recent post about American Atheists. ← I can haz apostrophe? Word I’ve never said to a woman: nice pie. I LOVE peaches. White peaches, in particular. And I pronounce “white” the way Stewie Griffin does. Haha, no. But I had a student in my last class who pronounced every “wh” word with the “h”. Actually, he added an “h” to every “w” word, too. It whas pretty funny. But I guess you had to be there, lol. Ooh, yes, I love pies that have a lattice-y crust across the top, especially if the crust is all sugar-y. Great stuff!